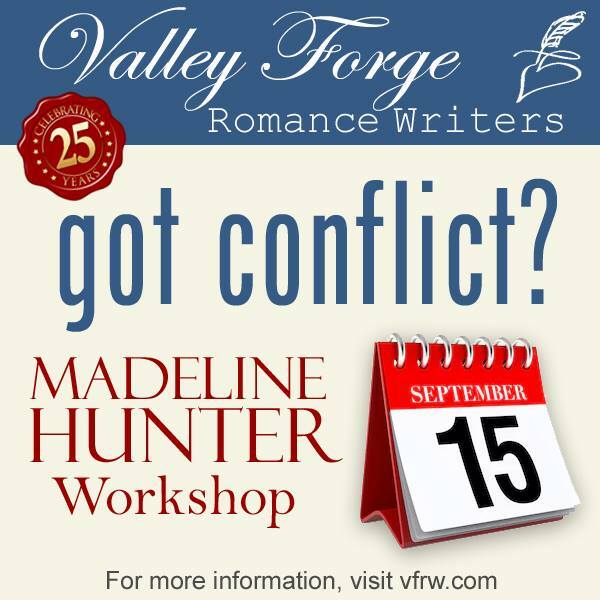 You’re invited to an all-day writing workshop offered by Valley Forge Romance Writers, featuring NY Times best-selling historical romance author Madeline Hunter, at Montgomery County Community College in Southeastern Pennsylvania. Register now and join us September 15, 2018! Bring a work-in-progress or a new story concept and leave with a conflict driven synopsis for a book that will wow readers and editors! For more information visit Valley Forge Romance Writers. 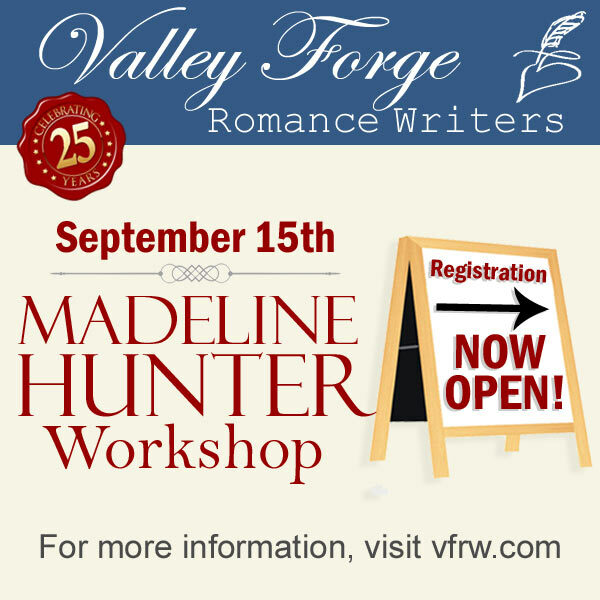 You’re invited to an all-day writing workshop offered by Valley Forge Romance Writers, featuring NY Times best-selling historical romance author Madeline Hunter, at Montgomery County Community College in Southeastern Pennsylvania. Join us September 15, 2018. Are you an aspiring romance author or a published romance author who’d like feedback on your manuscript from trained, experienced judges? 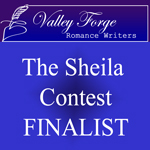 The Sheila Contest, hosted by Valley Forge Romance Writers, is one of the most respected writing competitions in the industry. Low entry free, helpful feedback, the opportunity to have your book read by editors and agents, and a generous cash prize for the best of the best. The deadline looms, so hurry to enter! Deadline is April 7, 2018. Here’s the link for details. Good luck! Are you an aspiring romance author or a published author who’d like feedback on a new manuscript? The Sheila Contest, hosted by Valley Forge Romance Writers, can help. On the path to publication of my novel LUXURY MODEL WIFE, releasing May 2016, I entered The Sheila Contest with an early draft of the manuscript under a different title, and finaled in the competition. Though I was happy to have scored high enough to make the cut and win a finalist badge, I didn’t win my category, or even take one of the top three spots. Fueled by the desire to make my book a winner, I took the feedback I received from the judges to heart and revised the entire manuscript. After revisions, I polished the book again. And again. And again. I changed the title to LUXURY MODEL WIFE, and when I thought the manuscript was ready, pitched the rags to riches story to my publisher. Within a week I received an email with the magic words “love the book” and a contract arrived soon after. If you’d like feedback on a work in progress or the opening of a completed novel, The Sheila Contest opens for entries March 13. 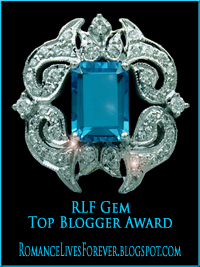 You do not have to be a member of Romance Writers of America to enter. Eligibility: Participation is open to all romance writers who are unpublished, self-published, and published. Entry must be the author’s original unpublished work and not under contract. First Round Judges: Three (3) qualified, trained judges, including: General, PRO and PAN members. Fantasy/Futuristic/Paranormal: Nicole Resciniti, The Seymour Agency. feedback for your romance novel from the pros. 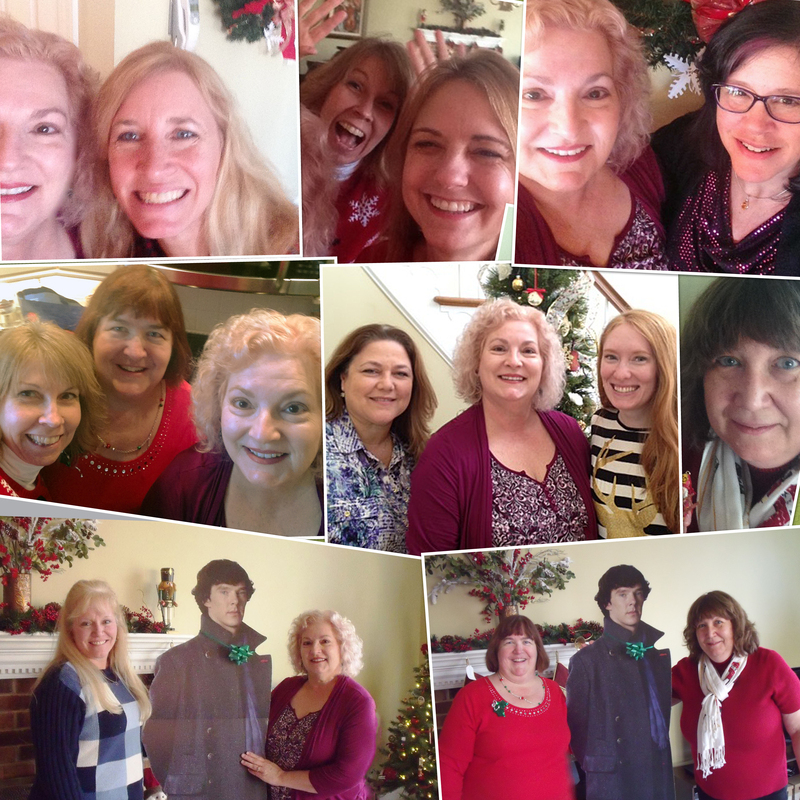 Members of Valley Forge Romance Writers, a Pennsylvania chapter of Romance Writers of America, celebrated the holidays in style with special guest Benedict Cumberbatch’s cardboard facsimile. Benedict stood patiently for hours to pose with authors including (left to right) Judi Fennell, Adele Downs, Terri Brisbin, and Leslie Lighton. Authors pictured with Adele Downs in less than flattering, but fun, selfies, top left to top right are: Veronica Forand, Lynn Kellan, Alleigh Burrows, and Stephanie Julian. Authors featured in the center photos with Adele Downs are Lynn Kellan, Terri Brisbin, Cate Price, Kristin Contino, and Leslie Lighton. We enjoyed appetizers, wine, desserts, wine, a gift exchange, wine, desserts, and lots of laughs at our holiday bash. Lucky Veronica Forand won the cardboard version of Benedict Cumberbatch. 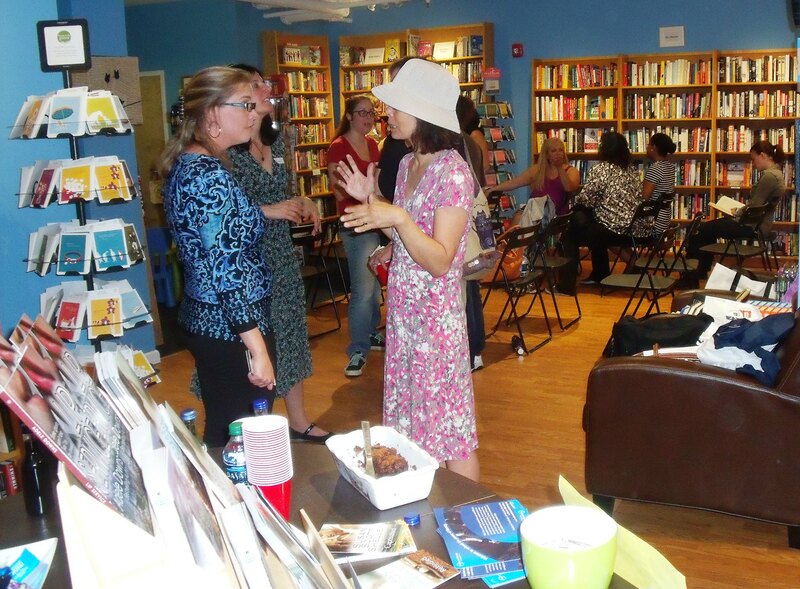 Despite torrential rain with heavy downpours and street flooding, romance lovers turned out for an evening with authors Susan Scott Shelley, Judi Fennell, and Adele Downs at Main Point Books in Bryn Mawr, PA and gave us a warm welcome. 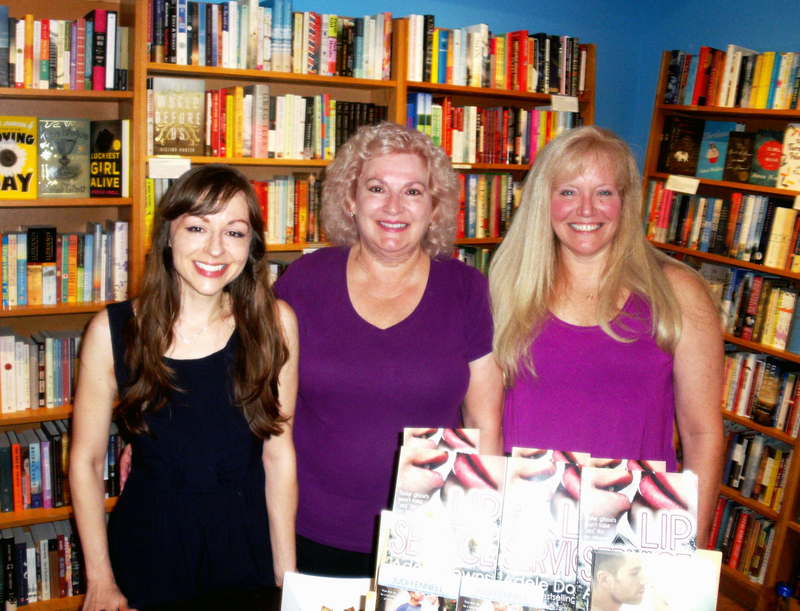 Susan read from her book Rekindled, Adele read from Lip Service, and Judi read from What A Woman Wants. We sipped wine, nibbled chocolate, gave away prizes, and had lots of laughs despite the weather. 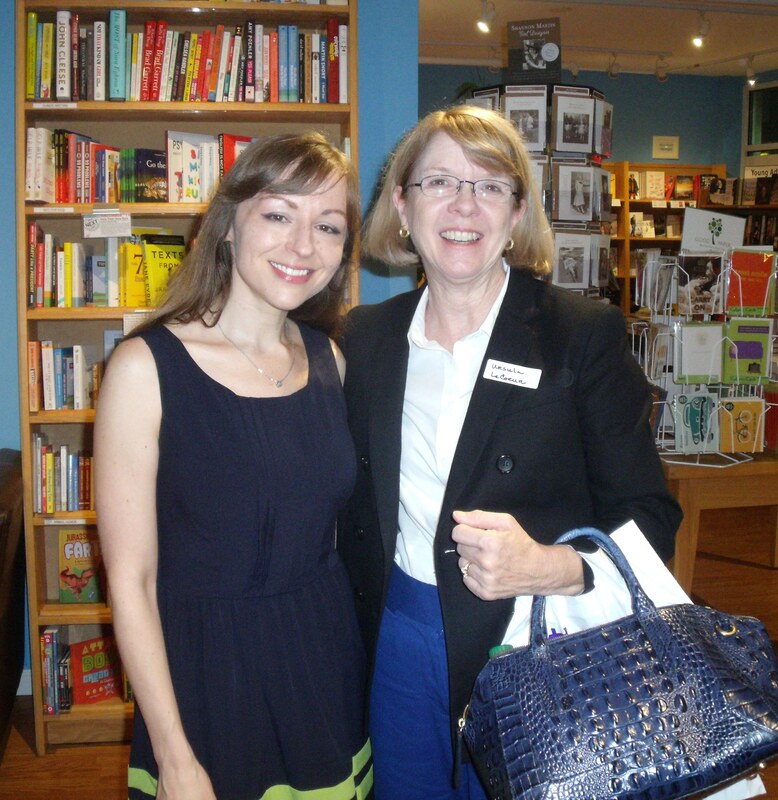 Proceeds from the event benefitted the Center for Literacy, Philadelphia. New York Times best-selling author and former Green Beret, Bob Mayer, often has interesting things to say about the publishing industry. I especially liked his blog post of April 29, So You Want To Make A Living at Writing? : 13 Harsh Truths. In his candid article he included a rant by science fiction author Harlan Ellison called, “Pay The Writer.” I agree the expectation that writers give their work and their time away for no compensation has gotten out of hand. Bob Mayer presented a half-day workshop at my local chapter of Romance Writers of America, Valley Forge Romance Writers, with his business partner, author Jen Talty, on Saturday, August 4, 2012. The following is a repost of a report I wrote about his presentation on another blog soon after his visit. The information is still fresh, so enjoy. Bob Mayer’s presentation to writers was offered in three parts: (1) The Original Idea: the heart of your story and key to selling your book. (2) Outlining and Plot: the events of your story. (3) Beyond the ebook: how do you sell it? Rather than try to regurgitate Bob’s presentation from my notes, I’d like to share some of his insightful and helpful off-the-cuff comments. The following are not direct quotes, but bits of information he imparted that I found interesting. • Write what you’re passionate about. • 90% of all requested submissions following author pitch sessions with agents and editors at conferences are never sent. • The traditional publishing route takes about three years from idea to bookstore. • Traditional publishers invest their promotional dollars on a few select authors. 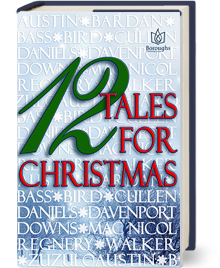 The remaining authors are left to fend for themselves in a ‘throw it against the wall and see what sticks’ approach to sales and marketing. • What traditional publishers think readers want, and what readers actually love, are often two different things. The same with filmmakers. When the movie “The Godfather” was completed, the studio feared they had a flop on their hands. They thought the public would hate the film. Instead, audiences loved the movie and it became a huge hit. Later, “The Godfather” became a classic. • It’s anybody’s guess as to what will happen in this new Wild West of publishing. This is the time to invent something. Try something new. Bob went to Barnes & Noble to pitch a “Nook First” thirty-day exclusive sales option for authors and launched the program when they accepted his idea. This partnership gave him high visibility on Nook and garnered big-dollar sales. • The secret to publishing success is tenacity. • An author should have at least three books for sale before expecting long-term sales results. Ebook sales have a ‘long tail’ and build over time. A few years ago, ebooks sold quickly in the first month or so. That has changed. These days, book sales take time to accumulate. • Privately, I asked Bob if he, or someone he knew, offered a book analysis service. I’m not necessarily interested in hiring a line or content editor, but someone to take a critical look at one of my completed novels and offer her insight as to its strengths and weaknesses. Bob suggested I ask readers to look at my manuscript. “Readers, not writers,” he said. “Writers tend to be too critical.” So…I’m changing my strategy and searching for beta readers to offer feedback on my novels after my critique partners have helped with the technical aspects. Do you have publishing insights to share? If so, please leave them in the Comments section.